I read in Wind Bell XII, 1973, you want recollections of Suzuki Roshi, so here's mine. Back in the latter part of 1967 I started dropping in the old Zen Center, the one that was next to and seemed part of, a Go players' club. The address of which was given me by some long‑haired, bearded guy at a book store via a copy of your paper of that time. The paper had some suggestions about zazen, like "When rising in the morning cast off your beard like a pair of shoes you no longer need." Can't remember how the others go. Anyway, I decided to give Zen, or rather the Oriental men everybody in the place kept bowing to, a trial. The way I had it figured the Oriental guys were a duet of con men taking advantage of the aimless and gullible. But on the other hand maybe these guys did know, or thought they knew, whatever. So it would have to be a fair trial. Which meant to me I had to put my whole head into this zazen. And if after say three months of this zazen stuff, if I still felt the two Orientals were pulling a fast one on everybody, I would pay 'em back for it in spades. I don't like being made a fool of and making a fool out of myself for three months, just to find out I've been made a fool of is just too damn much. But three months to keep from making a big mistake was worth it. So, well, I'll pass up the details and just say I went from stuffing cotton in my ears, to beating myself and nailing blankets over my doors and windows to seeing a bright light rising off the floor and flying around my room at about ten miles per. My room's only ten by twelve so I had to keep myself in second. Anyhow I ended up in three months' time back at this Zen Center place. I walked up stairs in a stupor, found myself to some chairs, and sat. It must have been lecture day cause that's what was going on. Suzuki Roshi came in, looked into everyone what seemed a long time, not a sound. Then he started talking, beating around the bush. Like chopping meat for an old dog. Then he got to the point. He held up a curved stick and said without affirming its existence or negating its existence what is it. The following came into mind. It's a stick. No! It's a tree. Wow I can't tell a stick from a tree I must answer. The Roshi kept saying, "quick! quick!" I was half out of my chair. I swear I felt like a chicken about to lay an egg. My eyes seemed to pop out. I was choking on my own words, gasping, sic sic sic sic . . . . The ageless old man looked into me and I felt he would come right down over the rows of chairs and people and grab this now neo‑student chicken and force the egg out of me. I'm sure he would have beat me with that stick or tree, whatever it was. But he didn't, he just turned and walked out. 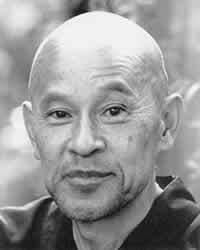 I saw Suzuki Roshi many times before the time I just told about, but never met him formally before that day. If you know what I mean. Another time long before this trial of mine, I was sitting upstairs in what seemed to me the spectators' section looking at the people sitting cross‑legged on black mats and pillows. I glanced away for a moment and all of a sudden there was a commotion. I turned back in time to see that Suzuki guy come in like a fierce wind blowing those guys off their pillows. Some landed on their behinds, others on their sides. One guy landed on his head and didn't get up too swift. As for me I left immediately.